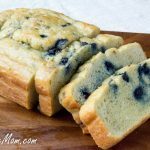 This Low Carb Keto Blueberry English Muffin Bread Loaf is gluten free, grain free and perfect for an easy make ahead breakfast! I can’t think of an easier breakfast than one that’s actually made when you’re not rushed for time. 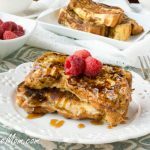 Make ahead breakfasts rule my world and being a mom of 3 who homeschools and works from home full time, I need all the help I can get on any weekday morning. Recently I’ve made a few quick english muffin recipes. The 2-Minute English Muffin is a single serving made in minutes in the microwave. The second recipe is my Paleo English Muffins in which I changed up the recipe and made them in the oven for 4 servings. The third is my 1 minute Cinnamon English Muffin which is a single serving, but is nut free. But this recipe if for all the folks who have neither a microwave or those fancy English muffin molds to make them in. The loaf idea just came to me, figuring it would just be a whole lot easier to enjoy the texture of an English Muffin with a little bit less work than making individual servings. While I don’t think it works as well as using the rings or molds or ramekins, it is quite nice to just make the batter and dump it in a loaf pan. I increased the amounts of my ingredients as well so you can get a dozen slices that are a perfect size. 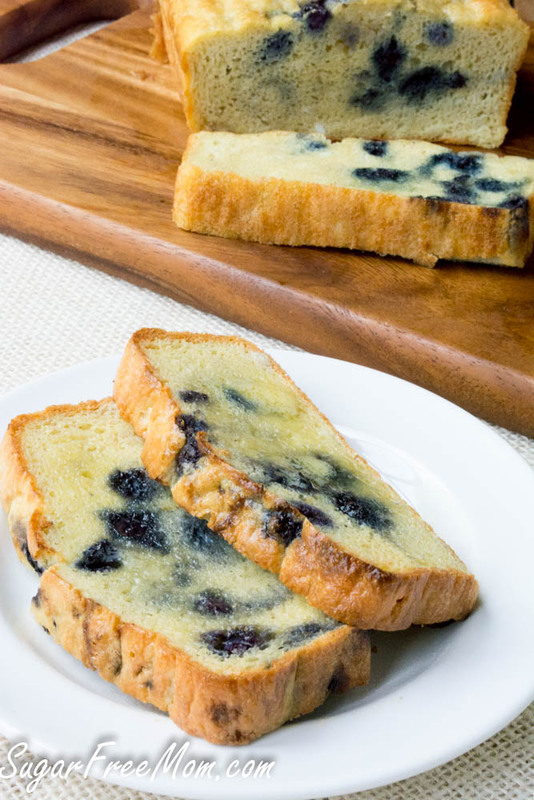 Blueberries are of course optional, but they do add a nice sweet little bite. 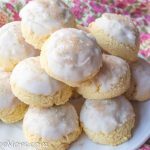 I used Wyman’s frozen since I always have them in my freezer and they always taste perfectly sweet! The edges cook well as brown nicely in the loaf pan, but I would advise toasting each slice if you still want that authentic English Muffin Style texture. It’s easier, it’s just as hearty and just as tasty as my original recipes. Top with a little butter and enjoy every bite without any of the typical high carbs from traditional bread. 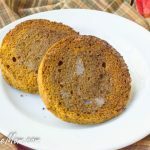 This recipe is an adaption of my Low Carb Paleo English Muffin recipe. Other milk options can be used to sub the almond milk. Blueberries are optional and can be left out if you prefer. UPDATE: After reading a few comments saying they felt the bread was a bit eggy in texture, I decided to reduce the original recipe using 6 eggs to 5 eggs and that is what you see in the video. 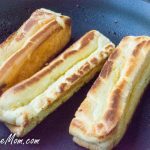 The texture is great using either 5 or 6 eggs, once toasted it’s delicious! In a microwavable bowl melt nut butter and butter together for 30 seconds, stir until combined well. In a large bowl, whisk almond flour, salt and baking powder together. Pour the nut butter mixture into the large bowl and stir to combine. Whisk the almond milk and eggs together then pour into the bowl and stir well. 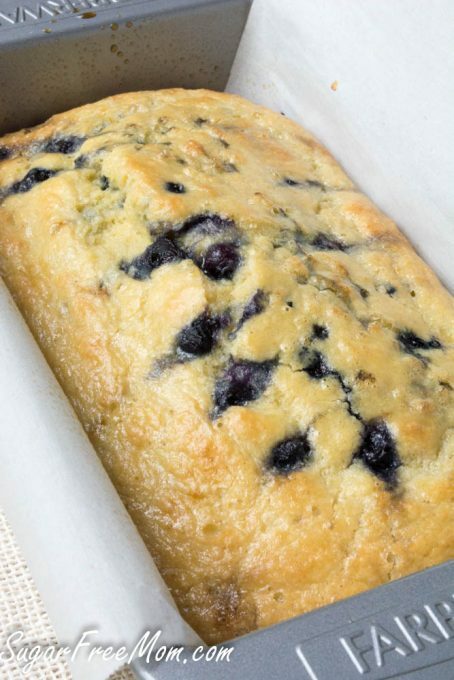 Drop in fresh blueberries or break apart frozen blueberries and gently stir into the batter. Line a loaf pan with parchment paper and lightly grease the parchment paper as well. Pour the batter into the loaf pan and bake 45 minutes or until a toothpick in center comes out clean. Cool for about 30 minutes then remove from pan. Slice and toast each slice before serving. Brenda this recipe looks great!!! I plan to try it soon. Should this be baked in a regular 9 x 5 standard loaf pan or something smaller??? I would appreciate knowing so it will come out right. Thanks for all your hard work in helping us to be sugar free. Yes that’s what I used. Hi Brenda, I have made this recipe twice and it looks nothing like yours, nor does it become crispy in the toaster. Mine is dark, not light and the blueberries are at the bottom in a mushy layer of dough. O’ve tried adding them both before and after putting in the oven. Basically, my bread is a slimy shape of grease. Any clue what I’m doing wrong? Did you use fresh or frozen blueberries? You can toss some lightly in almond flour before adding to the batter. 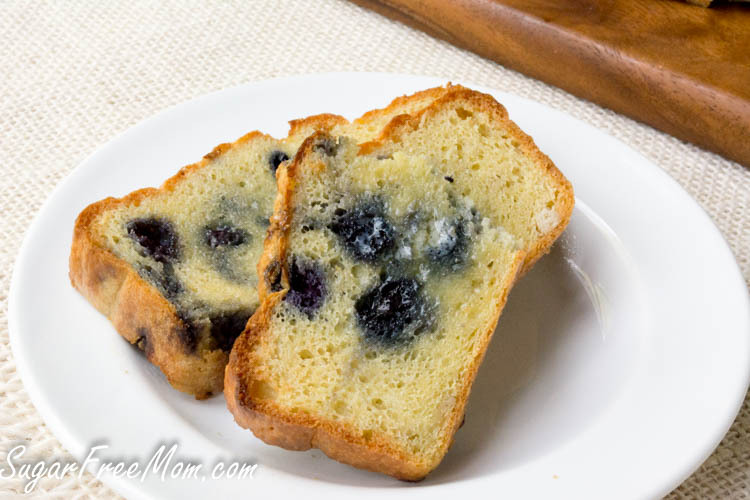 Another idea to pour the batter into the loaf pan and sprinkle the blueberries into it a few at a time so it. Throw some in lightly to stay on top, throw some in harder to reach the middle and bottom. How many carbs total in a loaf? Thanks! This recipe looks amazing!! I am glad peanut butter can be subbed for cashew butter and will definitely try that. Can these go in the toaster without falling apart?? I’ve had some messy breads that end up crumbling on me. They will hold well in the toaster and actually taste great without being toaster so yes they will hold together no problem. I really want to try this. 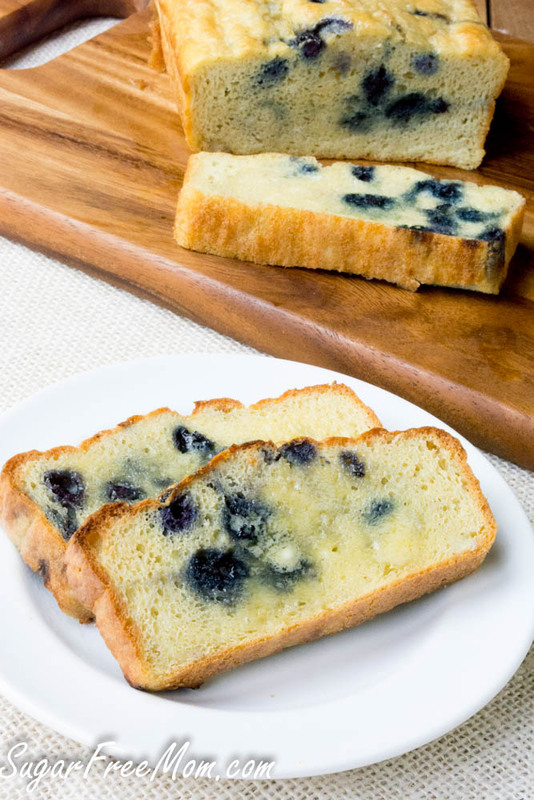 Can I use fresh blueberries or will that change the texture of the bread? No you can use fresh as well. Hi, I just made this recipe today and it is lovely! 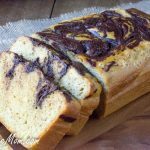 Great texture, holds up really well for toasts and it tastes wonderful. I used fresh blueberries and they all sank to the bottom. 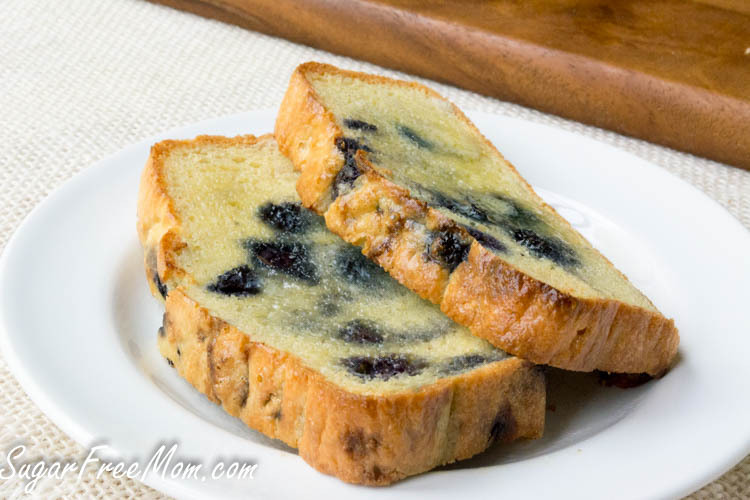 Do you have a trick or tip on how to make the blueberries mix more even throughout the loaf? Thanks for sharing this recipe. I loved it. Ok for the fresh berries I would toss them in a little tablespoon or two from the dry ingredients, it will help absorb some of the liquid from the fresh berries, then stir them all into the batter at the last minute and bake immediately. 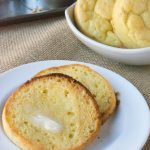 Really want to try this but I need some guidance, I really don’t like the taste of egg in my bread and when I see 6 eggs I assume based on history there is bound to be an egg taste (your cloud bread tastes very eggy to me but your ricotta pancakes don’t and neither does your english muffin -LOVE IT). I need a quick breakfast for busy mornings. With that said will this recipe have an egg undertone to it? If yes, is there anything I can do to change it to make it taste less egg like. Thanks, so to be a pain! This is based on my English Muffin recipes and not the CLoud Bread recipe so really does not have an egg taste to it. What is the carb count on an average piece? Are this net grams? I would like to know what carbs you subtract from total. is it only fiber? or also alcohol? I do not count sugar alcohol as it does not effect blood sugar. I subtract fiber from the total carb count. Sugar alcohol does affect blood sugar, although not as much as regular carbohydrates. As a type 1 diabetic, I must factor in sugsr alcohol when determining the amount of insulin I need. I have a close friend who is also diabetic and has said that sugar alcohol has no effect on her blood sugar. Also there is no sweetener in the recipe so no sugar alcohol to count anyway. Can I use fine almond flour ? What are substitutions for the cashew butter? I’m assuming you wouldn’t use just regular butter? Mentioned sub under “Brenda’s Notes”. Love your recipes and want to try this but I have an almknd allergy. Do you think coconut flour would work? Will I need to increase eggs or liquids to make this change? I think I’d try using 1/3 cup coconut flour. Let me know if that works out for you. Mine came out soaking wet used frozen and they were all on the bottom!! It was quite gross! Could u do anything to not make it soggy? Could you use coconut flour? I think the frozen berries was probably the issue. Coating them in a little almond flour before adding them to the rest of the batter would help absorb some of their moisture and help to not have them sink to the bottom. Sorry! Try toasting pieces to salvage it. I am absolutely opposed on using micowaves and am surpised that you suggest so since microwaving destroys all foods and even water. This recipe is made in the oven. I made this recipe and it tasted like pure egg, not like a bread The texture was too spongy. What did I do wrong? Would these work as muffins. If so how would you change the baking time and temperature? I’ve not tried this as a muffin, I’d probably reduce the cooking time by half. Very yummy! My cashew butter didn’t have added sugar so I added 1/4 cup of swerve. Next time I’ll add 1/2 cup. I used half and half because I was out of almond milk. I also made them into muffins! Delicious! Can I use a sub for the cashew butter that is not nut based? I have this in the oven right now. I did add a touch of vanilla powder. Can’t wait to try it!! Just made this and while it came out great with coconut oil and peanut butter subs, the egg taste makes me want to GAG! Do you have any go-to suggestions for subbing out at least some of the eggs? Six in such a small amount of area is way too many. I’ve adapted the recipe to 5 but you can reduce to 4. I’m going to add more almond flour next time I make it to see the texture for those who don’t like eggy taste. I have a Q about the cashews as to why you chose those? I’m asking because those are nuts highest in carbs. Is it because there the lightest in color? I did feel yes light in color but also not as strong in flavor as peanut and almond. Looks so good. I cant be trusted with this much. I need to see if u have a blueberry muffin mug cup! You might need about 6 ramekins or mugs for individual servings. Should the Cashew butter be salted or unsalted? Mine was salted but either is fine. I only have extra large eggs. How many should I use? I would think to reduce by 2 eggs. Yes if extra large, just use 4. I had a disaster with this recipe but I’m in England so maybe the measurements were wrong. No idea. Also there was no sweetening agent in the recipe – my cake ended up tasting purely of salt and sharp blueberries. Also used almond butter for lower carbs. Feedback appreciated on what I might have done wrong! I’m sorry you had trouble. I didn’t add any sweetness because typically in our traditional english muffins here in the states they aren’t meant to be sweet. You can certainly add your sweetener or choice to the batter. Under the ingredients is an option to click US measurements or Metric. Would it be okay to substitute the eggs for egg whites only as I am allergic to the yolks? I’m not quite sure if it will work without the yolks since I’ve not tried it. I just made this. I Did not add blueberries and made my own cashew butter. It has a green tinge. Is that from all the eggs?? I’m not quite sure why that happened. I know when using sunflower seeds and baking powder that happens because of the chlorophyl, but not sure why that happened for you. It’s not from the eggs I do know that, did you use almond flour? I bet this would be good with some added lemon zest as well! Hoping to try this soon it definitely looks yummy! Could you please give me amounts in weight rather than in cup measurements ? You have to melt butter before you can measure it ! Under the ingredients there’s an option to use US measurements or Metric, click which you like. Christine, there are several ways to measure butter without melting it. Most butter wrappers include lines indicating the number of ounces (size, not weight) each portion would be. If your butter doesn’t include those measurements, adding butter to ice-cold water in a glass measuring cup always works. If you need, say, 1/4 cup of butter, fill the measuring cup with 3/4 cup of cold water and add butter until the water rises to the one-cup mark. Pour off the water, and you’re left with 1/4 cup of butter. do you think flax seed meal could help with egginess? I have some golden flaxseed meal. I made this recipe exactly as stated. Sorry, but I was very disappointed – which is a rare occurrence with your recipes, Brenda. The texture was like rubber and the favor was odd; not quite egg tasting, but almost. I’m so sorry to hear that! The texture was like rubber? Do you think it was overcooked? Mine always comes out soft and once toasted it’s got a perfect chew to it. Did you use cashew butter? Maybe you’d prefer using peanut or almond butter instead of cashew? 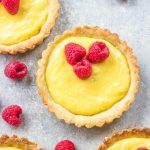 Have you attempted to make this with coconut flour instead of almond flour? If so instead of 1/2 cup almond flour how much coconut flour since you can not equally exchange the amount. I’d love to try this because it looks delicious! I have and it was dry so I’m working on making a nut free version, still needs some work. Could you keep the slices in the freezer and then toast? I didn’t know if the bread would be too soggy if frozen. You could that would be fine. 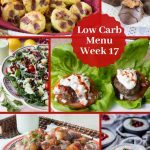 An interesting low carb muffin recipe. Would definitely try out this weekend. I made this bread with the following subs and modification: I used vanilla peanut butter, butter (actual butter, not ghee or coconut oil) and added 1/3 cup coconut flour. Texture is a bit custard-like. Not bad at all but. I’ll increase my added coconut flour to 1/2 cup next time. I coated some frozen blueberries in flour and dropped on top and then gently pushed just below surface with a spoon tip. Then, sprinkled on few extra frozen blueberries (non-coated). Some sunk in a bit and some stayed a-top after cooking. I like it! For me, this will replace my sweet tooth cravings! Thank you Sugar-Free Mom for the recipe! Brenda, I tried the recipe last night and experienced the sinking blueberry issue as others have noted above. I also wound up with an odd color that was not very appealing. I’m guessing the color was due to peanut butter versus a lighter colored nut butter?? The only thing I changed in the recipe was using an eighth of a cup ghee combined with an eighth of a cup coconut oil. You listed both as an option so I tried half of each instead of all of one. My batter was quite runny (like thin pancake batter) which is what allowed the blueberries to sink to the bottom instead of suspending in the batter. The good news is the bread still tasted good but much more like peanut butter than blueberries. Brenda, if you could spare a moment I have a couple questions. Would you describe your batter as thin, medium, thick, etc.? In the recipe you list a couple of optional ingredients. Would you be willing to share the exact ingredients you use when you make this recipe? If I wanted to make it a little bit sweet, what sweetener would you recommend that I add and how much? Brenda, thank you for all of your hard work and amazing recipes that you share with us. I appreciate you very much! God bless you! In my original recipe I used cashew butter which has a very mild flavor as opposed to peanut butter. I used frozen blueberries and just dropped them into the batter rather than stirring so they didn’t color all the bread blue. My batter was and has always been thin no matter how many times I make it. I’d recommend adding in Swerve sweetener maybe 1/4 cup for just a light sweetness. 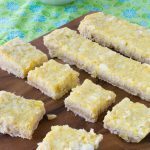 I’ve always only used butter when I’ve made this recipe and have not tried it with coconut oil. Hope that helps! Thanks for the reply. I forgot to mention that I used fresh blueberries. Next time I will use cashew butter, real butter (not ghee or coconut oil) and frozen blueberries. 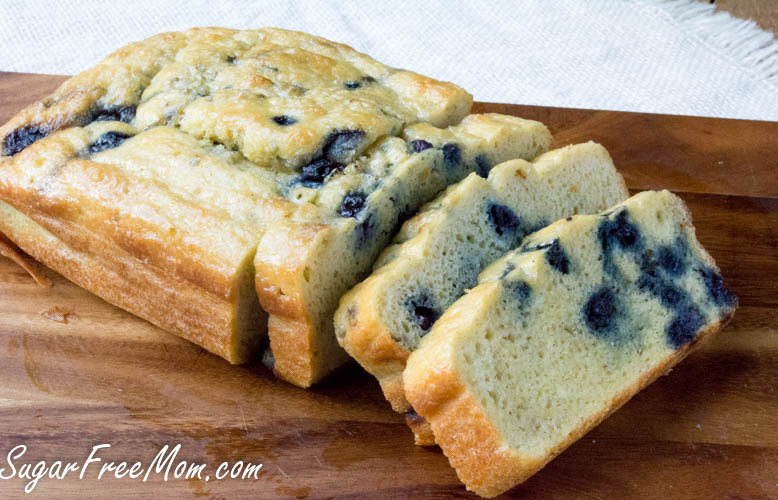 I will also pour the batter into the loaf pan first then gently add the frozen blueberries. Maybe that will keep them from sinking to the bottom. Thanks, Brenda!! I just made this today and it came out great. my family thought it came from the local bakery!! My wife and I have been on ketogenic diet for 6 months now. I made your bread more pastry style. I added 1/4 cup Pyure sweetener and 10 vanilla stevia drops. I also used the butter, cashew butter and coconut oil combined! I also added 2 tablespoons ground flaxseed, an extra 3 tablespoons almond flour, and 1/2 teaspoon xantham gum. I made all these adjustments due to the prior comments that you received. Thanks, Jeff for the mods! It’s in the oven now and smells delish. I must of not mixed enough. Mine cooked well but separated. A very distinct layer of eggs on the bottom and then the rest on top. Any ideas? First recipe I have tried of yours. Majorly disappointed. It was so gross. It tasted like grainy eggs. It needed a sugar substitute, way more vanilla. I even used vanilla almond milk. I toasted it in butter and did not make it taste any different. What can be used in place of almond milk? I don’t like the taste of almond milk. This sounds like a wonderful recipe for bread. 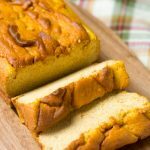 There is a lot of different items you could add to this recipe to make different flavors of bread. Please let me know about the milk please and thank you. Coconut milk would work or even dairy milk. I’m enjoying this right now! What a great recipe. After cooling, which felt like forever, I toasted a few pieces in the toaster oven, then added cream cheese to one slice and butter to the other. Y UM M Y.
I’m surprised that no one has suggested subbing flax eggs for some of the eggs thus reducing the eggy taste and increasing the volume of the bread with the flax. From the comments I have read it also appears that some may wish to use a sweetener. I will try this one soon. Just made this and am impressed. My husband even wondered if was something he could eat. He’s diabetic and has given up bread. I used frozen blueberries and they worked fine. Would post pic, but doesn’t seem to work. Thanks! After adding the almond milk/egg mixture to our forming “dough,” this became a liquid mess. I had to add in a handful more almond flour, and then even some occonut flour to get this to have any body to it before baking. It is not a typical “dough” and is quite liquid before baking. I think the added flour will produce a dense and dry bread. I tried this recipe. I added sweetener because the batter tasted too salty. I think next time I would add some coconut flour because my berries sunk and it’s a wee bit soggy on the bottom. Loaf tastes great, though. Thank you. Did this turn out good for anyone?? If so, what were your tweaks? I dont have many recipes that all my family members love, but this is one of them. Family with three kids, all eat low carb, two pre-teens, one toddler, they keep me busy, anything that feed all it is so helpful! And its really delicious! I used some blueberry extract & experienced no eggy taste at all. I also tossed my blueberries in a smidge of xantham gum & added them right before going in the oven. They could also be added after it baked a little while to avoid them sinking. The flavors are also better after sitting over night. 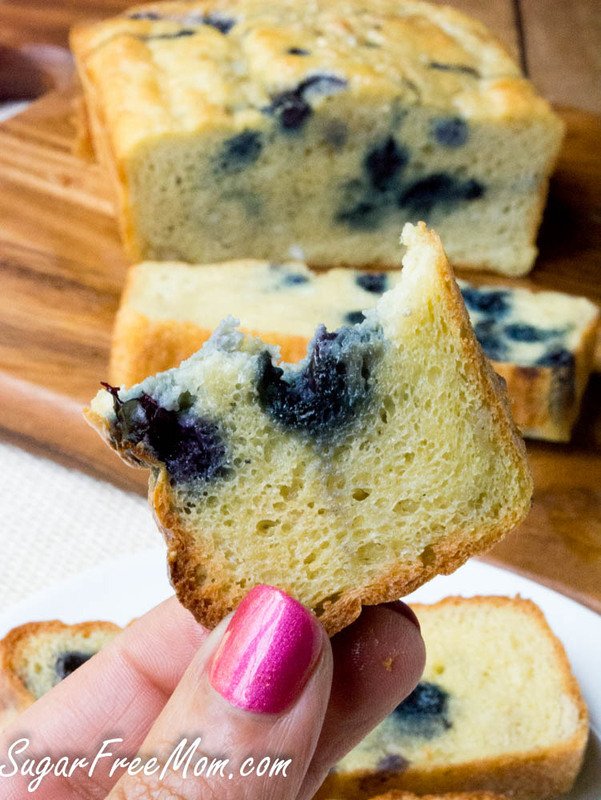 Thank you for this, blueberry yumminess! I made this and it was so gross. Tasted like egg and just awful, it was dark and slimy. I followed the directions to a tee but used almond butter. It looked nothing like the picture. I used fresh blueberries. Almond butter is much darker than the cashew butter I used when I took my pics. Egg size also plays a role in why you felt it was eggy tasting. Could I make muffins with this batter? Hi there. Working on this now, it’s currently in the oven. The recipe calls for coconut oil or ghee, but I don’t see it being applied to the directions. Can you clarify please? Step 1 melt nut butter with butter, ghee or coconut oil. Mine came out great!!! Toasted and topped w sugar free syrup. Reminded me of French toast. Sorry if this has been asked above, but any suggestions how I should store it once cooked? I wrapped mine in aluminum foil then stored in the fridge and then toasted when we wanted a piece. I made it, and added lemon extract, and 10 drops of lemon stevia drops. It rose beautifully, and tastes great. I coated the fresh blueberries with flour, but they still all ended up in the bottom. 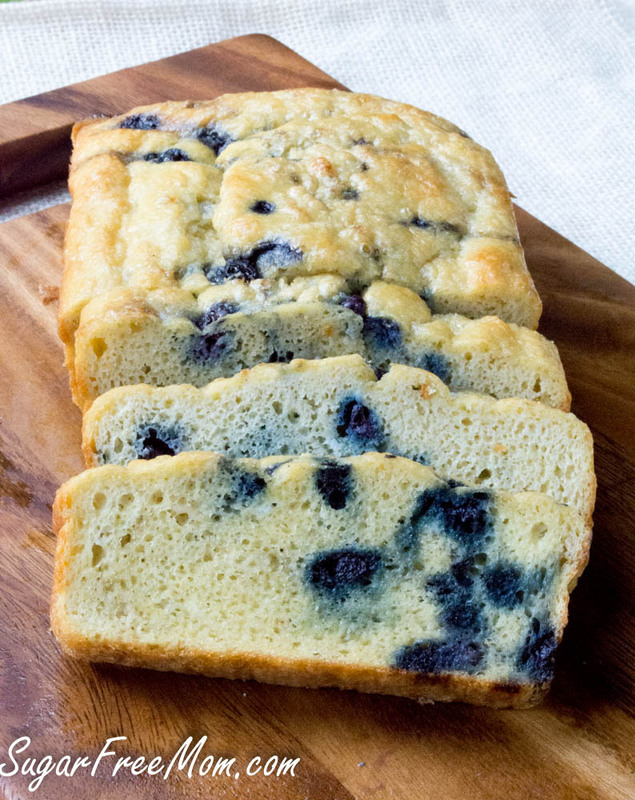 The bread texture turned out great and the blueberries stayed in place but it tasted so gross! Tasted like salt. I’m willing to give it another shot but definitely going to add some stevia.